A very wet forecast through Sunday as moisture continues to stream northward from the Gulf of Mexico. Another 2 to 3 inches of rain can be expected to fall between tonight and Sunday night with isolated totals approaching six inches ON TOP of what has already fallen. Any additional heavy rain that falls on already saturated ground will cause localized flash flooding. BE WEATHER AWARE. We received a bit of a break today (Friday) in Cookeville where just .09" was recorded since midnight on my weather station. Temperatures warmed on Friday to a high of 79.5°. On Thursday, July 4, I measured 2.46" in the 24 hour period with a high of just 71.6°. If this stands officially, it'll be the single wettest July 4 on record and the chilliest high on record. Just one year ago, we recorded the hottest July 4 on record. Nashville recorded their coolest calendar day high temperature on July 4th with a high of 71° beating the previous record of 74° set in 1946 by 3°. Last July 4th, the high was 103° which was a record. If you're wondering, Nashville's weather observations (officially) date back to 1870. 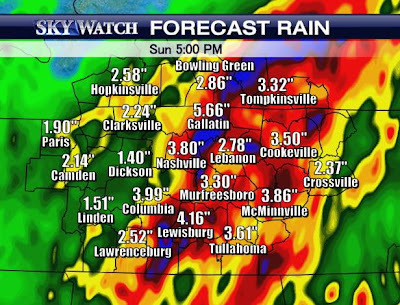 Cookeville saw some pretty hefty rain accumulations on July 4th with 3.71" recorded just south south-west of the city. Tennessee saw many reports of 5" plus as Fayettville down in Lincoln County recorded the most with 6.88". It'll be interesting to see how much was recorded today (July 5th) as we saw rain cover much of the area near Nashville. Check out the National Weather Service's Nashville office Facebook page.